Today’s guest post is brought to us by fellow STL blogger Jamey Stegmaier. Jamey is friends with the creators of STARCH, and he wrote a guest post on fried chicken for us back in January. He’s back with some thoughts about Korean quesadillas. I base 70% of what I eat on my immediate cravings (the other 30% is split up into everyday staples like oatmeal for breakfast and baby spinach for dinner). If something triggers a craving—perhaps a song on the radio about the beach (seafood) or seeing a UPS truck (chocolate)—I need to have it now. For the past 5 months, a food truck by the name of Seoul Taco has been parking near my work every Thursday. 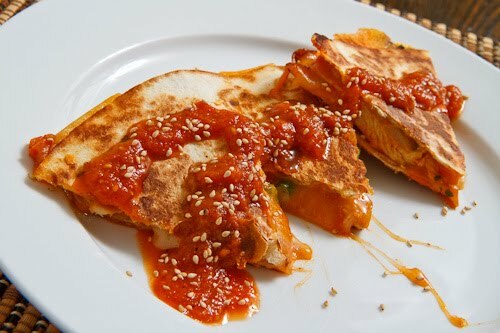 They make these absolutely delicious Korean quesadillas (and Korean tacos), and they’re quite popular. It’s not unusual for them to have a line 50 people long. When you get home from work, marinate your chicken. Or pork. Or beef. Any of the meat triumvirate will do. I prefer chicken because it’s easy to shred by hand after you cook it. The marinade should include sugar, soy sauce, sesame oil (just a little bit), siracha, and gochujang. Never heard of the last two? Don’t worry, your local grocery store probably has them. Look in the Asian/Mexican aisle. Do whatever you do while you’re waiting for things to marinate. If I actually need to list suggestions here, we need to have a talk. I’m sure you can think of something to do. Bake the chicken until it’s cooked. If you’re able to think ahead by one day—that is, if you’re more evolved than I am—cook then chicken the night before and then marinate overnight. If you do things in the order described here, you might want to toss the cooked and shredded chicken in the marinade described in #1 so it retains the full flavor of Korea. Heat sesame oil on the stove while you prepare the other ingredients. The other ingredients in question are: thin slices of cheddar cheese, refried beans, and quesadilla shells. I’ve tried out a variety of shells, and I’m still not sure if I’m picking the right ones. Any suggestions in the comments would be greatly appreciated. Cook your quesadillas. Here’s the order I use: (a) Put quesadilla shell on the pan, wait until it gets all bubbly, (b) put that shell hot-side-up on my cutting board and throw another shell on the pan, (c) put cheese on one half of the shell and refried beans/chicken on the other, (d) fold it in half and put it on the frying pan after taking off the other shell, (e) crisp both sides of folded quesadilla while you prepare the next one. Dress the quesadillas with sour cream and siracha. Siracha is a bit spicy, so apply per your tastes. It actually gives me migraines, but it’s one of those foods that I eat because the pleasure of consuming it outweighs the pain that will follow. You know what I’m talking about. And that, my friends, is how you satisfy your Korean quesadilla cravings. If you have any tips for enhancing the recipes, let me know. Until then, you can find me drooling onto my office window every Thursday while Seoul Taco is parked outside.